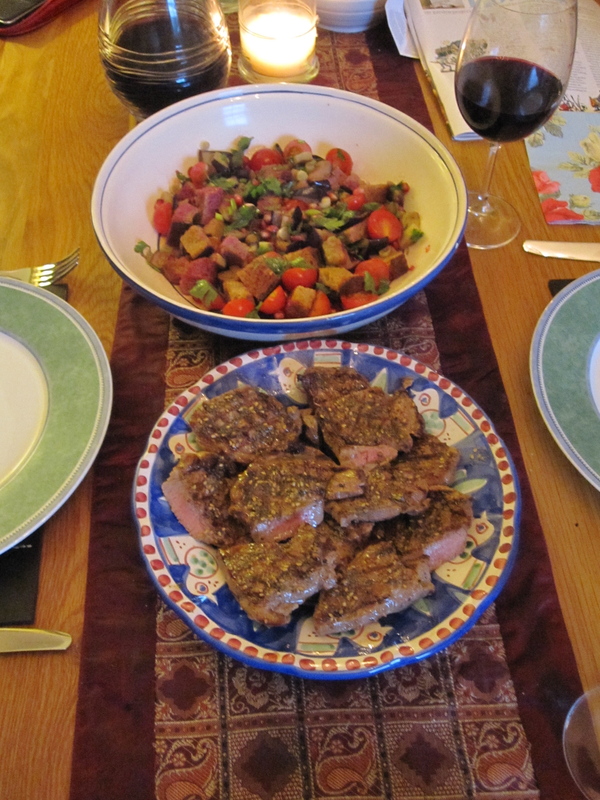 There was some fabulous food at my friend Chris’s party on Saturday night. The weather even took a break from rain and we were able to eat outside in the garden; although it wasn’t ‘hot’, it was definitely feeling a bit like summer at last. There was a huge bowl of fattoush, a Lebanese bread salad, much like the Italian panzanella, which I liked a lot. I’ve often made the Italian version but never the Lebanese, so The Single Gourmet Traveller settled down with some cookery books yesterday morning and searched for a recipe for supper. By way of Claudia Roden and other great cooks, I almost inevitably found my way back to Moro East. 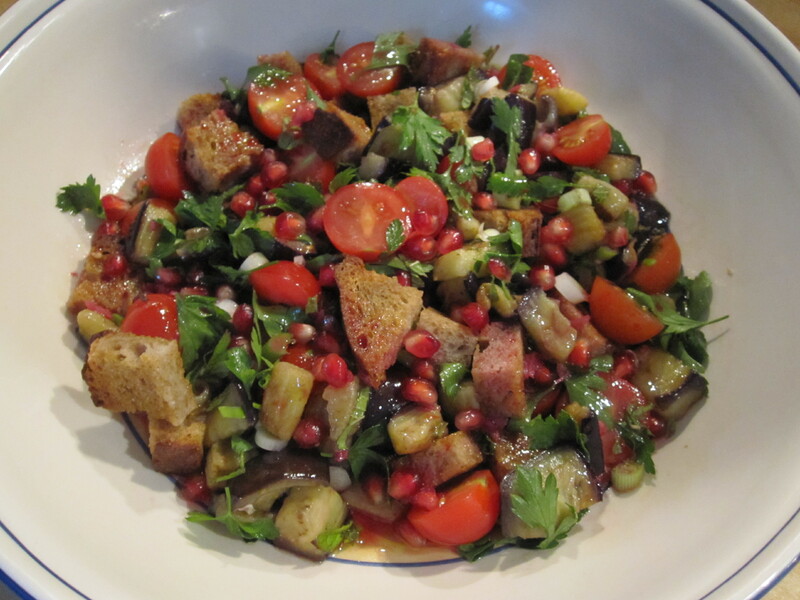 I liked the sound of Sam and Sam Clark’s Syrian version of fattoush with aubergines and pomegranates. Fattoush is traditionally made with flat – pitta – bread, and it’s often a means of using up stale bread. Vegetables in season, such as cucumber, tomatoes, peppers, radishes, are added with sumac and lemon juice being a frequent seasonings. 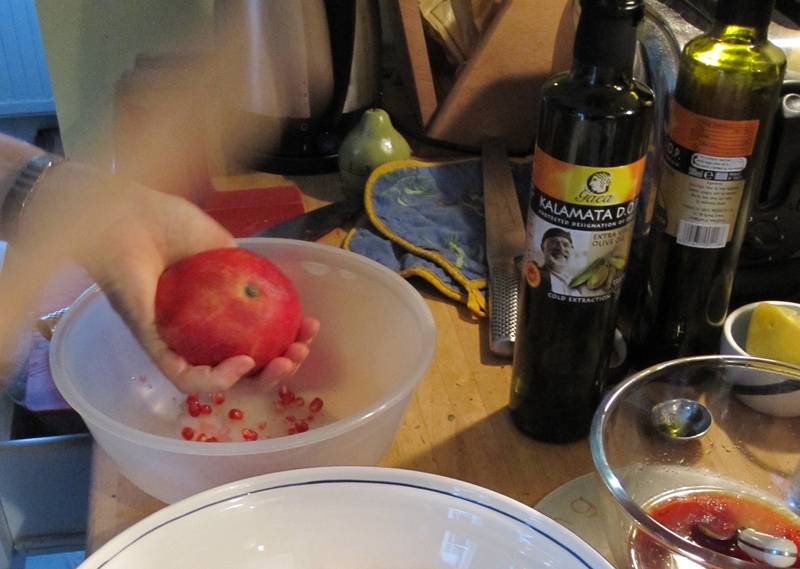 Claudia Roden does mention adding pomegranate seeds in her Mediterranean Cookery book. I didn’t have any flat bread and although I’ve made some before, using a recipe in Casa Moro, which is surprisingly quick and easy, I decided to take the simpler route of using some of my two-day old country bread from Paul. It was this lack of authenticity that made me decide not to call this recipe post ‘Fattoush’ – but maybe that will be a later one, and more Lebanese based. However, the version (with slight variations from the Moro recipes) that emerged from my kitchen last night was very good indeed; a stunning combination of flavours. So here it is and if you try it, I hope you enjoy it as much as we did. Firstly, cut 1 aubergine into small cubes (1.5cm), put in a colander and sprinkle with 1 teaspoon salt and leave for about 15 minutes for the bitter juices to drain. 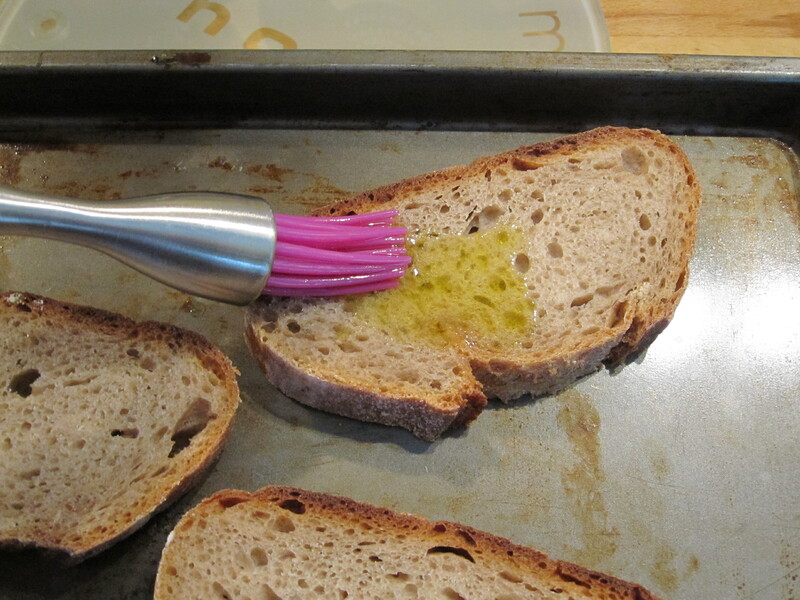 Cut 3-4 slices of good country bread (only 2 slices from a large loaf, though) and brush both sides of each slice with olive oil. (You could of course use pitta bread if you have it, but split in half and then brush each side with oil.) Crisp the bread in a 180C oven for about 15 minutes and cut into bite-sized cubes. Meanwhile, prepare the pomegranates and make the dressing – you’ll need 2 pomegranates. For the dressing, squeeze the juice from 1 pomegranate through a sieve and carefully pick out any bits of the bitter pith that get through. Crush 1 small garlic clove with a little salt to a paste and add to the pomegranate juice with 3 tablespoons extra virgin olive oil. Set aside and prepare the other pomegranate – you need just the seeds to go into the salad. I used just half of my fairly large pomegranate. The technique I use for getting the seeds out is a Jamie Oliver one: hold the half pomegranate, split side down, in one hand and gently beat it with a rolling pin and all the seeds drop out. Again, if any bits of pith escape, take them out. Now wash the salt off the aubergines cubes and dry with kitchen towel, heat about 6 tablespoon olive oil in a large frying pan and then gently fry the aubergine until a nice golden brown colour. Drain on kitchen paper. 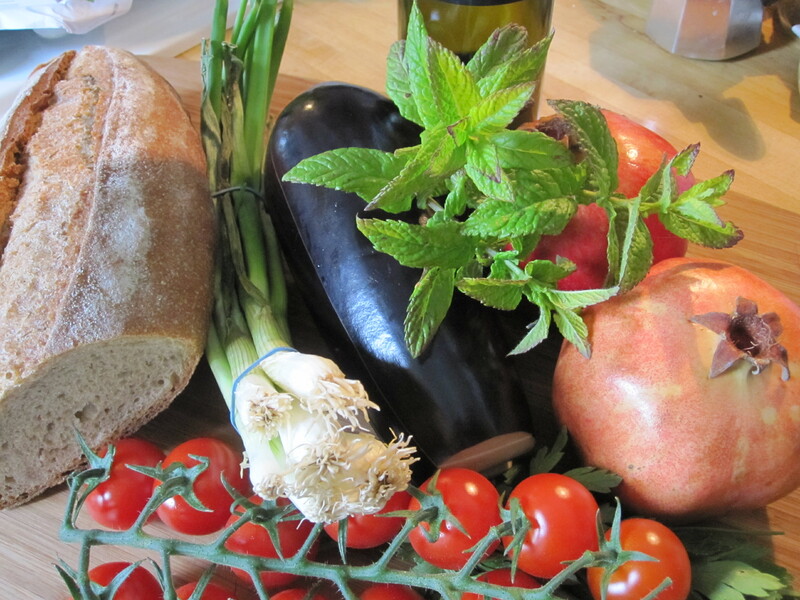 Start assembling the salad: put the aubergine pieces into a large bowl with the bread cubes. Add 12 cherry tomatoes, halved, and 3-4 spring onions, trimmed and thinly sliced. Roughly chop the leaves from 2-3 sprigs of mint and pick off the leaves from a small bunch of flat parsley to add to the salad. Now add the pomegranate seeds, keeping back a tablespoon. Pour over the dressing and toss the salad very gently so everything is combined. Check seasoning and add some salt and black pepper. Sprinkle over the remaining pomegranate seeds. You don’t want to make this salad too far in advance because you want some crispness left in the bread and the herbs but I put mine together a little in advance so there were a few minutes for the bread to soak up some of the lovely pomegranate dressing. Jonathan, who was on hand to take the action shot above of me getting the seeds out of the pomegranate, also cooked some lamb steaks to go with the salad. He marinated them for a little while in olive oil and lemon juice and seasoning, griddled them, then sprinkled over some za’atar. They were delicious and went wonderfully with the salad. However, I would also have been happy with the salad on its own as a simple supper, so definitely one to remember when summer puts in another of its rare and infrequent appearances!